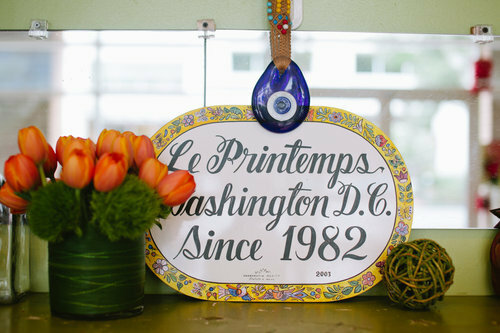 Le Printemps is a long-time Washington, DC florist located in the West End neighborhood of DC. You can order their designs online via their Bloompop Shop Page. Nestled between M and N Streets on 23rd in Washington D.C.’s Foggy Bottom is an oasis of llex berry branches, white orchids chilling in gauzy packages, dramatic arrangements of cherry brandy roses and antique hydrangeas, and a well-loved Roche Bobois sofa upholstered in weathered red and white kilim. 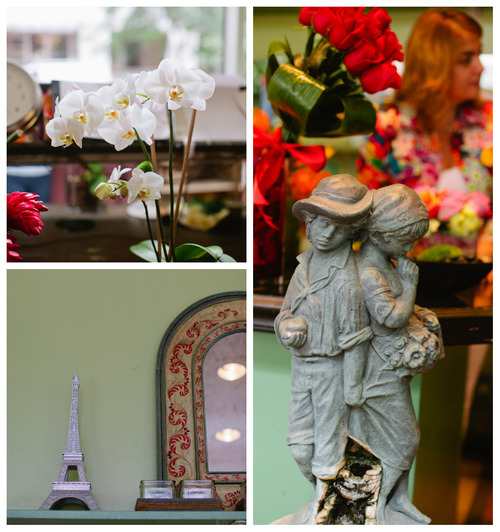 Owner Suha Kaidbey greets us with Le Printemps’ founding story, and we’re smitten. 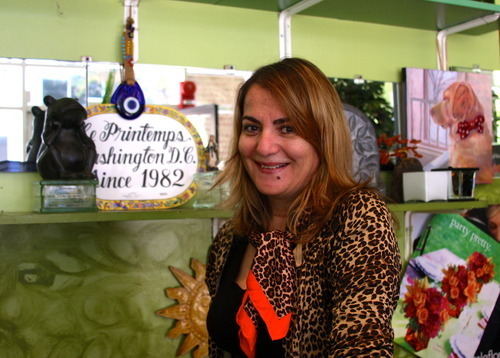 Her floral shop has been a family-owned business since its first day–and, after 30 years in business, it’s practically a D.C. institution. In fact, Suha’s signature mix of traditional, french compact, high style and contemporary floral designs grace the halls of many of the city’s other institutions–embassies, hotels, and corporate offices across the city have been loyal clients for many years. 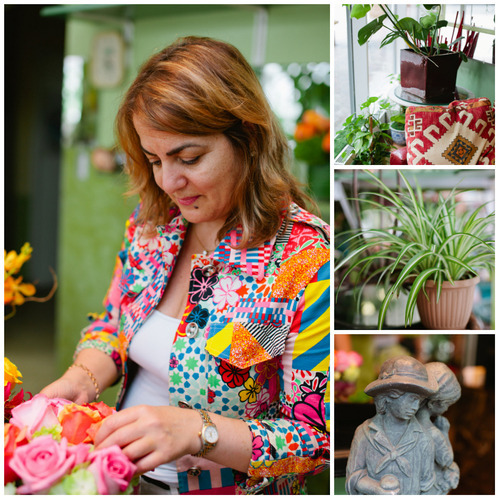 And for the past 20 years, Suha has been at the helm of that florist shop–managing orders, designing arrangements and delighting her repeat clients, whose well-earned trust gives her the latitude to create pretty much whatever she wants. The result? 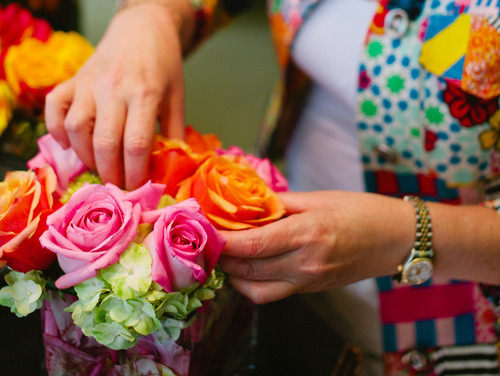 Gorgeous, innovative bouquets like the ones on her work table, which incorporate traditional elements (pink roses and mojito hydrangeas) with the unexpected (osage orange). 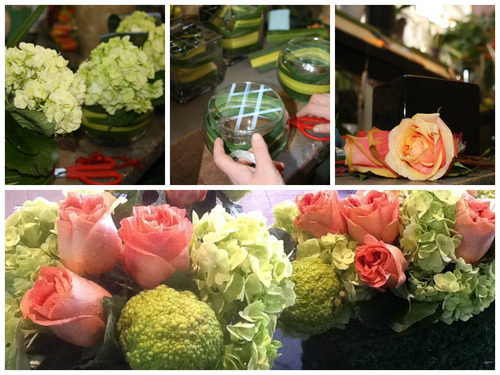 A self-taught floral designer, Suha creates one-of-a-kind flower arrangements for restaurants, hotels, embassies, weddings and events. For inspiration, she travels to Paris and the Chelsea Flower show. Her love for orchids, “the gem of flowers,” as she calls them, shines as she guides us through a photo book of her best designs–delicate purple orchids spiraling upward; the long green stems of yellow lilies coiled in a shallow vase. Suha’s love for floral design is matched by her love of people–she’s effervescent and engaging, generous with her time and and talent. If you’re nearby, stop in and say hello. We’re proud to feature Le Printemps on Bloompop. You can find more of her designs here at bloompop.com.